I intend to send out Christmas letters soon. Maybe tomorrow. First of all, the two weeks prior to Christmas were so busy. Three different employees took time off for the holidays which meant I had to cover their shifts personally. Because of that, I worked 104 hours the two weeks prior to Christmas. Plus, I had a house-guest. Plus, there was the whole thing about Christmas coming, which meant decorating and buying gifts and making the magic happen. So, I didn’t write the letter early. Or even on time. But I wrote it. Then, I had to collect updated addresses from a few of my nomadic friends. After that, I decided to create a new address data base on my computer. I used to have one but that was an old computer and I lost all that information in a computer crash a few years back. So, I typed in all the addresses, adding in the updated ones I’d acquired. Now, I want to use the power of the computer to simply print out mailing labels, but first I will have to figure out how to do that exactly. I have the labels. I have the computer. I have the addresses all typed in. It’s just a matter of time. Time keeps on ticking and my “New Year’s Letter” will be a “Valentine’s Day Letter” if I don’t get it together and quick. Doesn’t it seem like Christmas was a million years ago? My denuded Christmas tree is still in the living room, waiting to be wrestled into its box. 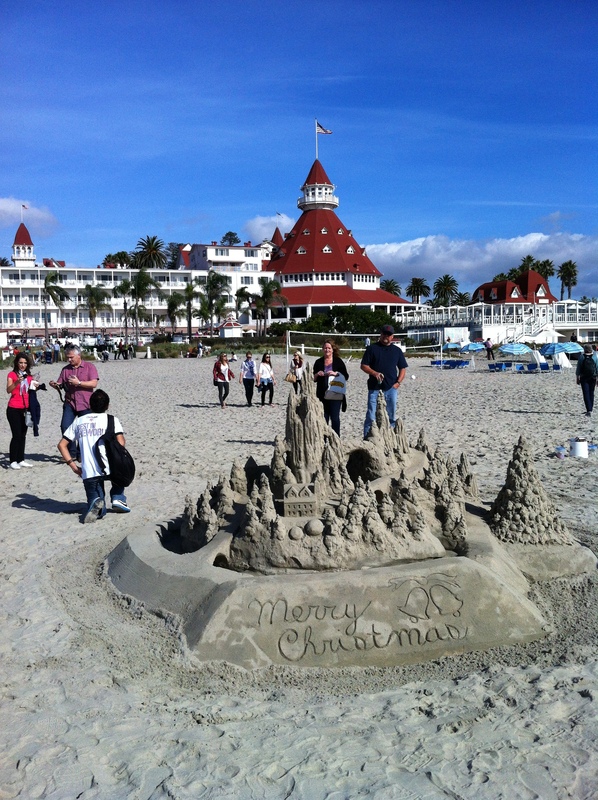 But let’s contemplate sand castles built for the holidays at The Hotel del Coronado, shall we? But I remember a time when the cards would just pour in. You are so lucky,with that weather….. It looks like the other people had cameras out, too. So you weren’t alone in your idea of capturing the “Merry Christmas” around the base of the sand castles. My first batch of Christmas cards this year was a picture card I had made. Didn’t order enough, so I then went to a generic store and bought a box of regular cards to send out, with a photo I made copies of at the drugstore. My problem with that was – after addressing the envelopes (in long-hand, as I’m not very computer savvy) I discovered the cards were bigger than the envelopes. Next year, I think I’ll do what I had done the previous three years – nothing! I’m in almost the same place. My cards have not yet all been sent out (but I’m getting closer – about 85% done I think). My tree has been undecorated but it still sitting in the living room, waiting to be put back in the bag and lugged out to the garage. Getting the village put away is going to take a lot longer though.